t seems that everyone is making fabric purses and carry bags! They are finding out how much fun it is to have softness, wash-ability, and oodles of pockets. 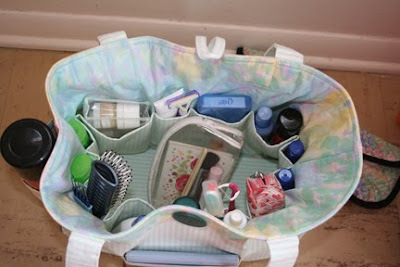 Have you noticed how you can not find cosmetics bags large enough for full size containers and hair blowers? Remember the 'train' case that use to be part of your luggage set? They are hard to find! Many travel by car and would love to find some way to quickly pack all the 'bathroom paraphernalia' without pouring all the soaps and sprays into tiny travel containers. Here is the inside of Lois' new travel bag. The blow dryer and the curling iron were left out for the sake of the picture. She is using some of her travel size containers because she had them, but obviously she has some choices. Can't sew? My daughter went to the baby section of the store and found a really cute diaper bag which had lots of room and large pockets. The bag was not labeled a diaper bag and she certainly could not resist lime green and brown! 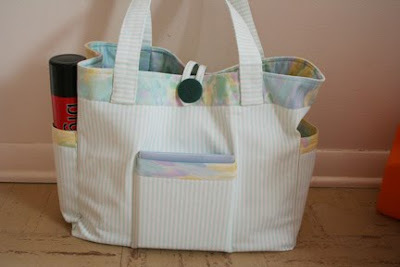 My husband already calls me the bag lady!I would like to make one that has a place for scissors ,knitting needles yarn etc,etc.I just haven't had the time to even research my pattern yet.So much to do,so little time as the say. This bag looks to be very useful. In the past I have made several different bags, including hockey bags. I have fabric to make some more shopping bags. Now I just need to get to it. That is a beautiful bag with various sized compartments. It saves time and effort to look for something inside. I will definitely look one for me. I have something very similiar for my knitting--going to workshops. It is Vera Bradley. I love the colors you/she used. Very lovely. Sorry for the inconvenience. I changed the setting already with the help of your suggestions. I didn't do it at first for I didn't know where to go. But thank you for bringing that up and for your suggestions. I hope you don't encounter any problems anymore. If there is just let me know. Thanks a lot. Have a nice day.